One of the biggest challenges facing vacation rental property managers is keeping systems and calendars up to date to avoid double bookings. The bane of rental managers, double bookings can lead to disgruntled customers and even bad online reviews, not to mention potential legal issues, which can undermine profit margins and bottom lines in competitive markets. But in order to avoid double bookings, systems must be constantly updated and monitored which can be time consuming and complicated. One very effective solution to the double bookings conundrum is a synchronized, streamlined online booking system. The causes of double bookings can range from data-entry errors, insufficient calendar updating, and lack of communication between agents. Simple human error can greatly impact the experience that customers have with your company. In order to avoid double booking nightmares, many property managers are turning to online booking systems. An automated, streamlined online booking system can provide the needed solutions to double booking woes. Bookerville's online booking system provides property managers with powerful, state-of-the-art tools which can be easily managed, eliminating many of the errors of manual bookings. Bookerville offers easy-to-use, accurate master calendar systems that are updated in real time and synchronized with all individual listing sites, Google, Outlook, and iPhone. Clients can see a version of the Master Calendar that can be embedded into your company's website, that offers a multi-property availability search. 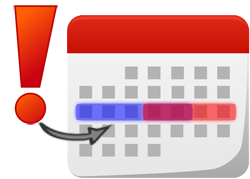 Potential clients can see available dates and existing reservations in listed properties, and book rentals, which are automatically reflected in the Master Calendar, eliminating double-booking risks. Additionally, Bookerville provides other online tools including client email templates, and automated scheduled emails which eliminate mistakes and create professional communications at the tap of a button. Stay up-to-date on all rental activity with the indispensable At-A-Glance feature, that allows managers to monitor activity at every property in a simple, easy-to-navigate format. Be 'in the know' about every client and every property with ease. Eliminate double bookings and improve the user experience with Bookerville. Sign up for a free 30 day trial of our software, with optional online booking, and see how easy it is to eliminate double bookings.